Every time I open up Instagram, I see a perfectly positioned model or influencer showing off their outfit. And without fail, I assume that seemingly perfect photo was effortless to capture. I always take it for granted that the person in the photo is naturally photogenic (and that if I'm not naturally photogenic, I'd never be able to pull off the same photo). But guess what? That couldn't be farther from the truth. Anyone who frequently has their photo taken just knows what works for them, mostly from trial and error. For Instagram's director of fashion partnerships Eva Chen, it's her Baby Giraffe pose, while the Barbie Feet pose is a favorite among celebs and models everywhere. It's no big secret how to produce an amazing outfit photo; it just comes down to knowing your angles. Obviously, everyone has a different angle that works best for them, but try the following tips and you'll realize that the perfect outfit photo is just a matter of strategy. From paying attention to camera angles to strategically positioning your body, we're sharing our top tricks and never worry about how to look more photogenic again. If you're ready to up your Instagram game, look no further. 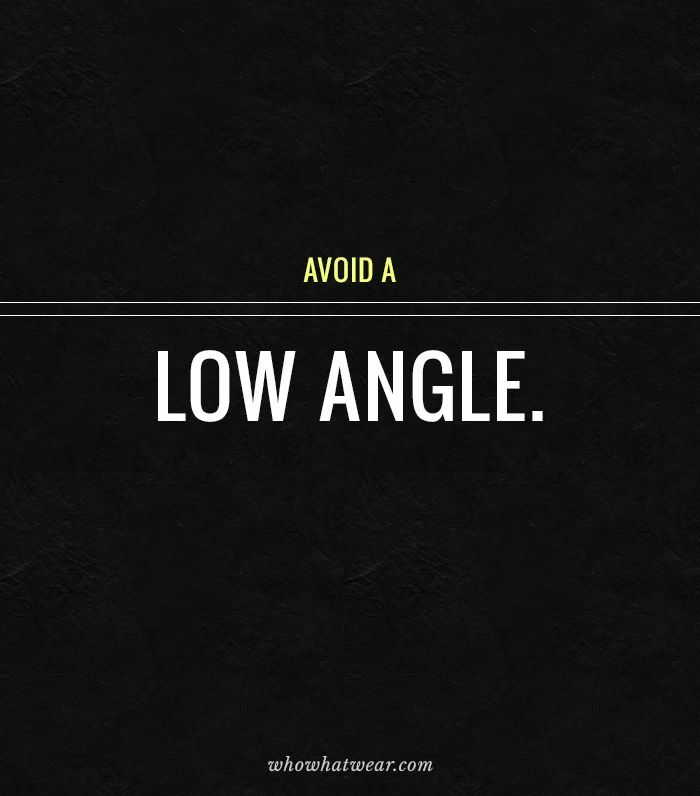 Lower angles, while sometimes a cool option, don't do you any favors. For a more flattering photo, position your camera slightly above your eye line. Generally speaking, the higher the camera angle, the better the photo. Posing with your hand on your hip will help slenderize your arm and keep it looking long and lean. Anytime your arm is slightly away from the rest of your body, it creates a flattering effect. Paying attention to your posture when taking pictures can make the world of a difference. Hunched shoulders and slumped spines will not elongate your figure. Instead, push your shoulders back stick your back end out slightly. It might seem silly to dramatize good posture, but we promise it will come across well on camera. This one is easy: Bulky clothing will make you look heavier than you really are, so stick to lightweight, thin fabrics, like silk, whenever possible. Obviously, you should wear whatever you like and show off your unique style in photos, but if a typical "flattering" image is what you're after, this is a good rule of thumb to follow. A straight-on body shot shows you at your widest, but if you stand at a slight angle, you’ll immediately look narrower. Fully to the side or even at an angle both work. Become your most slenderized self by dressing in darker shades. It's a known fact that wearing all black or head-to-toe dark colors makes you appear smaller in photos. Go for a darker Instagram filter, like X-Pro II or Mayfair, for an instantly bronzed image. Just like wearing dark colors, using darker filters or even adjusting the exposure and light filters can make for a more photogenic image. This trick will elongate your neck and help to avoid any unflattering chin angles. Not only will this accentuate your collarbone and slim your arms, it will also make you look more polished and put together—and that’s always a good thing. Shoulders back always! This is especially true when sitting in a skirt or dress. By crossing your legs at the ankle instead of at the knee, you’ll never expose too much thigh and will look leaner. Keep your arms slightly away from your body for a more flattering shot. Either put your hand on your hip, brush your hand through your hair or try keeping your elbow slightly out to keep your upper arm looking lean. If you’re taking a group picture, try and stand in the middle and slightly turn your body toward the person next to you for your slimmest angle. Pop a leg out and put your hand on your hip for extra points. No shame here, it’s all about finding what looks best for you. A little trial and error will help you find your best angle in photos so you know exactly how to stand to creat the perfect image. A cropped silhouette will show off your waist. Vertical stripes will always elongate your figure. This skirt's asymmetric hem will work to elongate your legs. Try any jacket that's belted to highlight your figure. The draped fabric will hang so nicely on your hips. No one does a wrap dress quite like Réalisation. When in doubt, a wrap top will always be a flattering choice. Always invest in black jeans. This makes wearing black feel anything but boring. The contrast topstitching exaggerates your curves in a subtly cool way. This cut is supremely flattering. With these insider tricks in mind, go ahead and show off to all your Instagram followers.